I loved the look of this box, what a cute pattern! 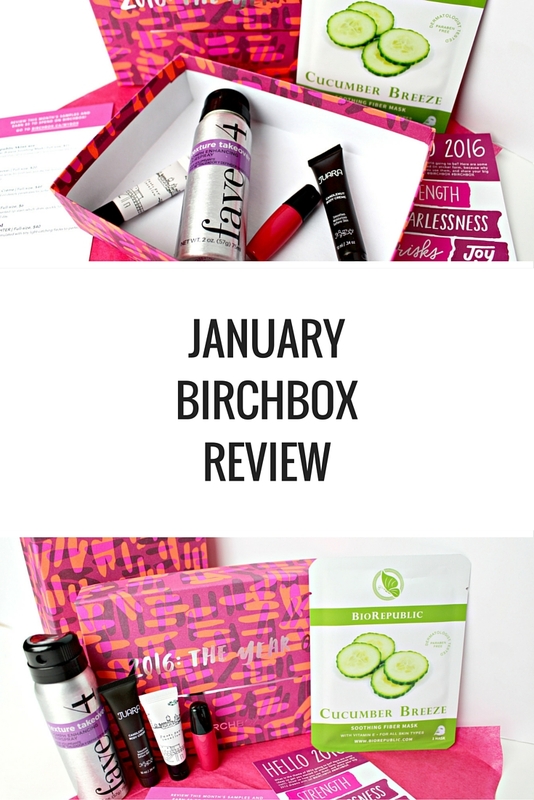 Products featured in this month’s January Birchbox review are Fave4 texturizing spray, Juara body creme, Too Cool for School highlighter, Tonymoly lip tint, and BioRepublic face mask. Read on to see what I thought and check out my favourites for this month’s box. I quite liked this texturizing spray. It helped thicken up my braids and make them pop more. It didn’t leave my hair feeling like there was too much product in it, which has been the case with other texturizing sprays I’ve tried. It also absorbs oil, so it’s great for 2 or 3 day hair – a definite bonus for me. This is something I’d buy if I saw it in stores. 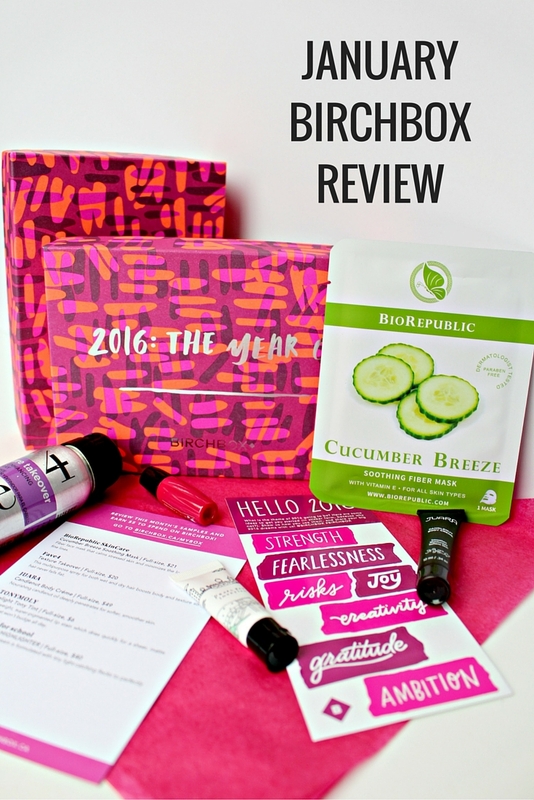 I was really happy to see this in my January Birchbox. 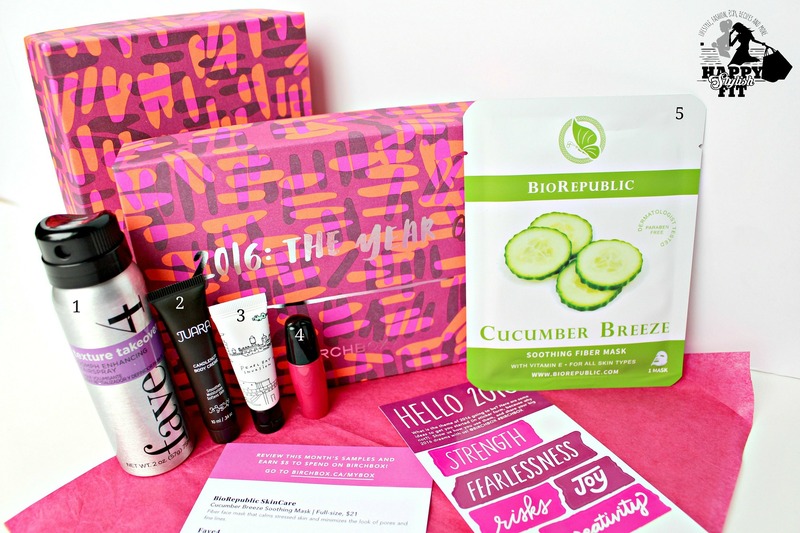 I had already received the full sized version in my Winter Fab Fit Fun box (check out that review here) and loved it. Now I have one to keep in my car to use as hand lotion. Juara’s candlenut body creme works great, and smells really good too. I’m not the biggest fan of cream highlighters, but I liked using this product along my brow bone as a highlight. I also can see it being good as an eye shadow for one of those days you’re in a super rush but want to add a little pop to the eyes. I expected the product to be a shiny white colour like a lot of other highlighters I’ve used in the past, but this one was a pearly pink which I think would suit a wider range of skin tones. I was a little unsure of this product at first, as it is super bright, and the formula is a little bit liquidy compared to other lip tints I have tried. The liquidy formula made me super paranoid about making a mess and I took my sweet time applying it and making sure it stayed exactly where I wanted it. It ended up drying quickly to a nice matte finish. I also really liked that it didn’t dry my lips out as much as other matte lip tints, and it’s totally kiss proof! I’m a little split on this product, it’s part hit and part miss for me. This mask was a little blah to me. I didn’t notice any difference to my skin after using it. It does say to use 2 – 3 times per week, so perhaps it would work better with multiple uses, but I prefer a weekly face mask with a noticeable difference. I’ll stick to my Pinterest face masks for now (check me out on Pinterest if you want to see what I use). 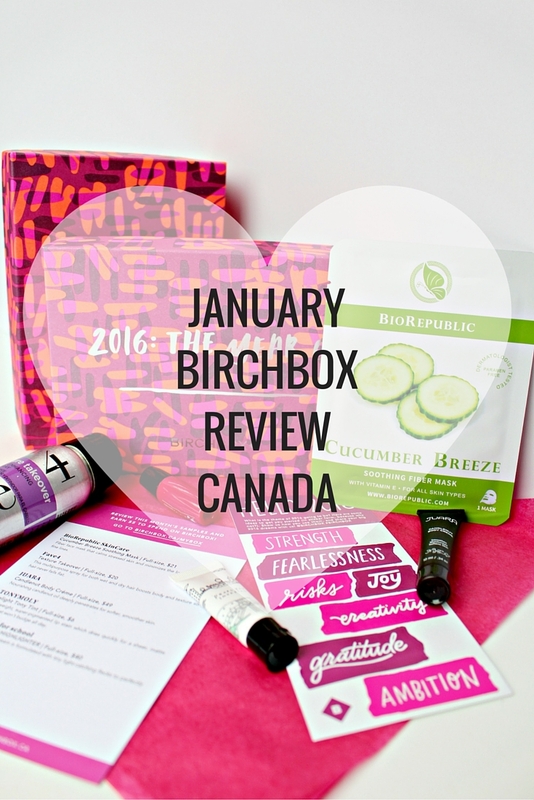 Overall I’m happy with my January Birchbox, I always love trying out new products and discovering new favourites. My favourite items were the Juara body creme, and the Fave4 texturizing spray. I also really liked that this box came with some bonus planner stickers, I’m a total sucker for cute stickers.